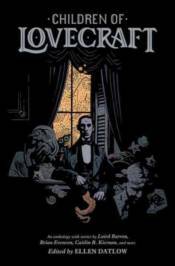 Dark Horse teams up with Hugo and Bram Stoker award-winning editor Ellen Datlow to bring you this anthology of original prose stories that are "inspired" in theme and plot by Lovecraft's mythos. No pastiches and no stories in his style. Using variety in tone, setting, point of view, time, but no direct reference in the story to Lovecraft or his works. Featuring work by Laird Barron, Brian Evenson, Caitlin R. Kiernan, Jeffrey Ford, Nathan Ballingrud, and many more, with a stunning cover by Hellboy creator Mike Mignola.